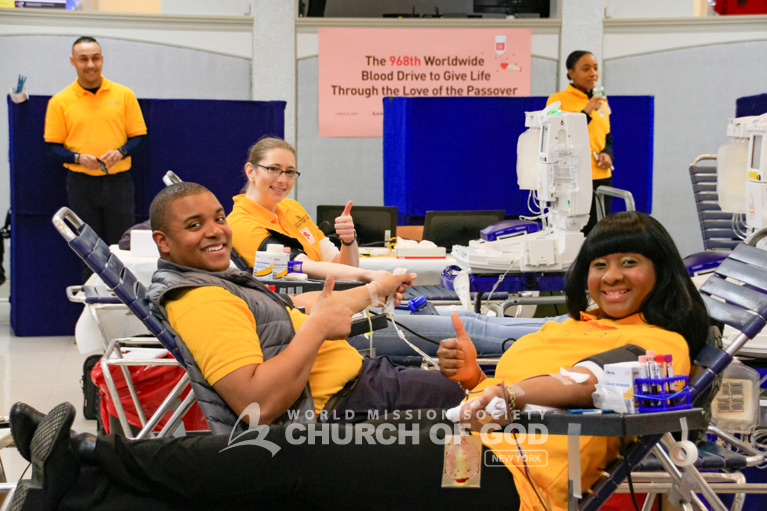 This past March, the World Mission Society Church of God held—not one or two—but 12 blood drives along the East Coast and in the Caribbean. 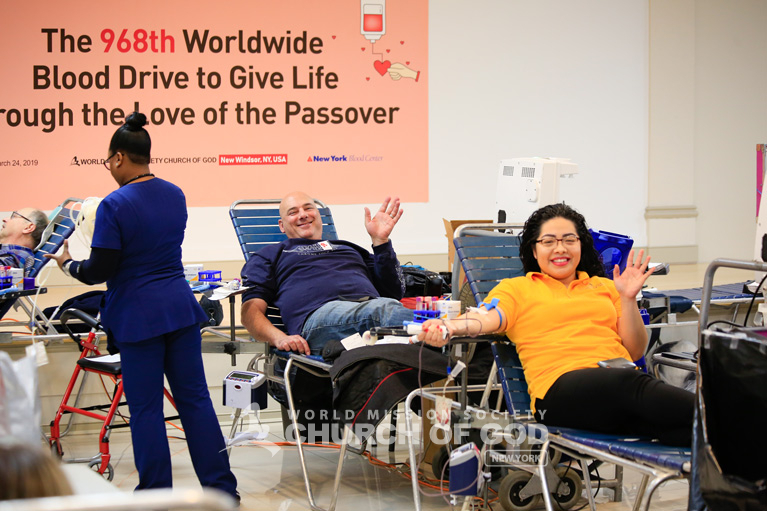 The 2019 Blood Drive for the Passover was organized to combat the blood shortages various states have experienced as of late. 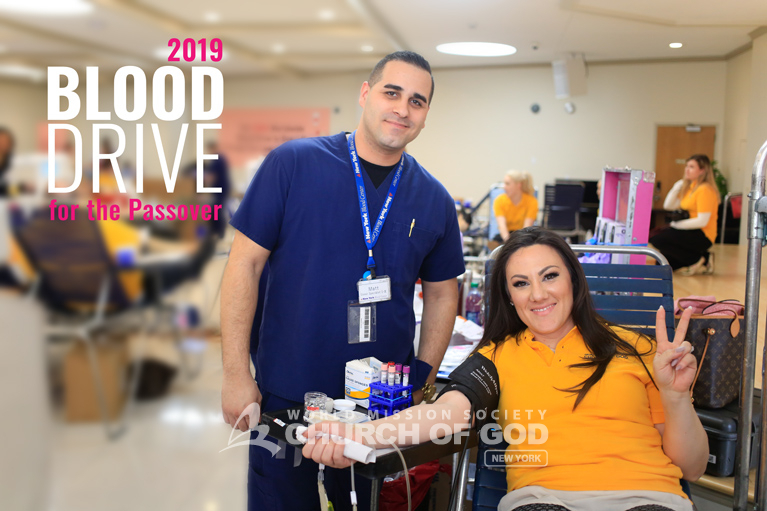 Additionally, the blood drives provided a great opportunity to raise awareness of the significance of the New Covenant Passover. The Church of God hosted the blood drive, working together with New York Blood Center to organize the event. Other Church of God locations worked with organizations such as American Red Cross, OneBlood, Massachusetts General Hospital, and Miller-Keystone Blood Center. Blood banks say that a single blood donation (one pint) can save up to three lives in need of blood. Then, what if 100 people donate? That means up to 300 lives can be saved! Finding strength in numbers, and knowing that good results come through unity, the Church of God in New Windsor participated in the East Coast-wide blood drive extravaganza. 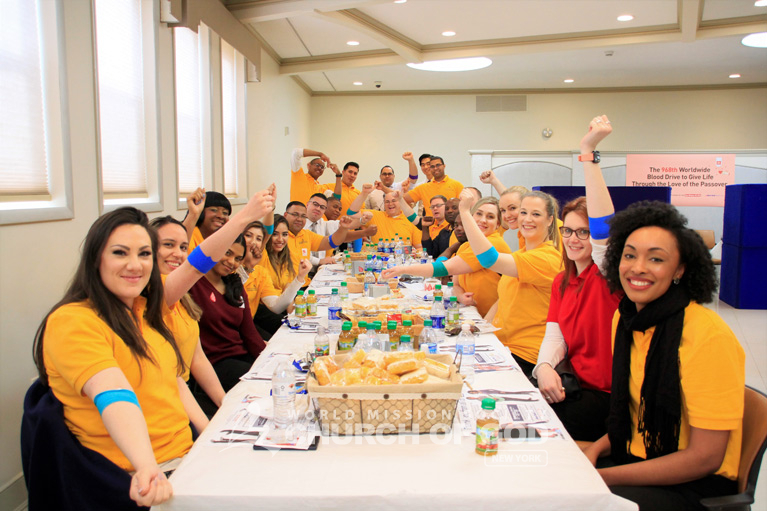 Volunteers wave as they donate blood during the 2019 Blood Drive for the Passover. At the Church of God in New Windsor alone, 145 donors gave their blood to save lives. The final tally of collected units was 148. Moreover, 30 of these donations were double red donations. So, potentially, 444 lives will be saved as a result of the blood drive. Donors at the Church of God give thumbs up during the 2019 Blood Drive for the Passover in New Windsor. Most of the donors had donated at previous Church of God blood drives. However, there were several donors who donated for the first time. Though some were nervous, they bravely gave their blood knowing how precious it would be for somebody in need. With the New Covenant Passover coming up, many of the members reflected on their faith. As they gave blood, they remembered the sacrifice of Jesus Christ. Giving us His flesh and blood to eat and drink through the Passover bread and wine, He said, “Do this in remembrance of me.” (Luke 22:19-20) The World Mission Society Church of God is the only church in the world that observes the New Covenant Passover. Contact us to learn more about the Passover so that you may also partake in this holy feast of God. Donors at the Church of God raise their arms with smiles after donating to save lives. Wow! Thanks amazing! Blood is very much needed in the days since there are many people who need it. There is a shortage but thanks to The World Mission Society Church of God for your beautiful contribution to helping the world by donating blood. The people who will receive the blood, thus saving their life will be very grateful. Keep up the good work!